Leading North-east financial advisers, Phil Anderson Financial Services has pledged its support to the local outdoor bowling scene by agreeing to sponsor the Whitehall Invitation Pairs for a further three years. The firm which has offices in Aberdeen, Ellon and Caithness have been the main sponsor of the event for the last three years and they have committed to sponsor the tournament for a further three years. 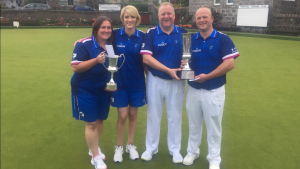 Next year will be the 45th year of the Whitehall Tournament which is widely regarded as one of the most prestigious bowling competitions in the area. Winners of this year’s event were Scottish Internationalists Stuart Anderson and Darren Burnett who beat local pair Bob Logan of Whitehall and Jason Banks of Inverurie in the Gents final and Scottish Internationalists Carla Banks and Stacey McDougall who beat qualifiers Alison Gilles of Dufftown and Isobel Laing of Moray in the ladies final.